Mandatory Provident Fund is down 0.26% for year despite strong January. A brewing trade war between the US and China is reportedly taking a toll on Hong Kong’s HK$843.5 billion ($107.5 billion) Mandatory Provident Fund (MPF), which is now in negative territory for the year, down 0.26% after having surged nearly 5.7% in January. Participants in the MPF lost an average HK$677 (US$86.25) each from their pensions in the first quarter of the year, according to MPF operator Convoy Financial Services. The 481 funds in the provident fund lost an average 1.85% in March, after losing 3.85% in February. The losses during those two months negated January’s strong 5.68% gain. Kenrick Chung, director of MPF business development at Convoy Financial Services, blamed the trade tensions between the US and China for creating great market volatility. He said in a release that MPF members should be more cautious in risk management, adding that investing in China equity funds is for investors with a higher tolerance for risk. The MPF underperformed Hong Kong’s benchmark Hang Seng share index, which gained 0.6% in the first quarter. 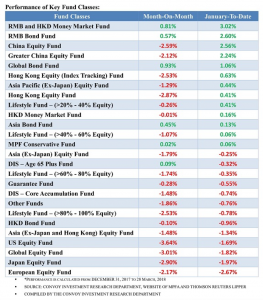 Asia-Pacific (excluding Japan) equity funds were the MPF’s top performers, down 1.29% in March, but up 0.44% for the first quarter. US equities was the worst performer, registering a 3.64% drop from February, and is down 1.69% so far this year. The global bond fund was among the better performers, rising 0.93% during the month, and gaining 1.06% during the first quarter. In 2017, the fund returned just under 23%, which was its best year since 2009. The MPF pension fund serves approximately 2.8 million people in Hong Kong. Salaried employees can choose to invest the contributions they and their employers make into the different MPF funds, which cover stocks, bonds, money markets and mixed assets.